Many travelers have strong opinions about India. They either love it or hate it, or feel both of the things at the same time. After a week of monsoon travel in Kerala, Southern India, I started to understand why. My flight from Dubai to India took only five hours. Still, it must have bee the biggest cultural leap of my journey so far. Instead of skyscrapers and motorways, the scenery now consisted of palm trees and narrow roads full of auto rickshaws, motorcycles and all other kinds of vehicles that made a whole lot of noise as they honked their way forward. The culture shock could have been worse if I had to survive the new environment all by myself. Instead, I stayed the first four nights of my stay with a local CouchSurfing host Danial and his parents in Kalady, a small village near Kochi (Cochin). I was really happy with this arrangement: in just a few days, I experienced more of India than I would have seen in a month on my own. The intense tempo also had some negative outcomes, but more on that later. My host Danial with his motorcycle. 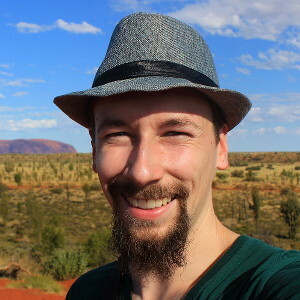 When I started my trip around the world, I wasn’t sure if I’d use CouchSurfing in Asia. The system of free accommodation with locals works very well in Europe. But in Europe, all the hosts came from cultures similar to my own. Would it be too difficult to do the same in a very different culture with different social norms? Then, I started to think. I’m traveling around the world. One of the points of traveling – heck, maybe even the biggest point of traveling – is to experience new cultures. Should I shy away from it just because the thought makes me nervous? And being as reserved as I am, I wouldn’t be doing much if I skipped all the things that make me nervous. Finally, I decided to go for it, and I’m glad I did. I had not done many preparations for my stay in the state of Kerala. I knew something about Kochi and the local culture, but I knew nothing about the sights and I had no idea what I’d want to see. Luckily, I didn’t need to, because Danial planned all the days for me. 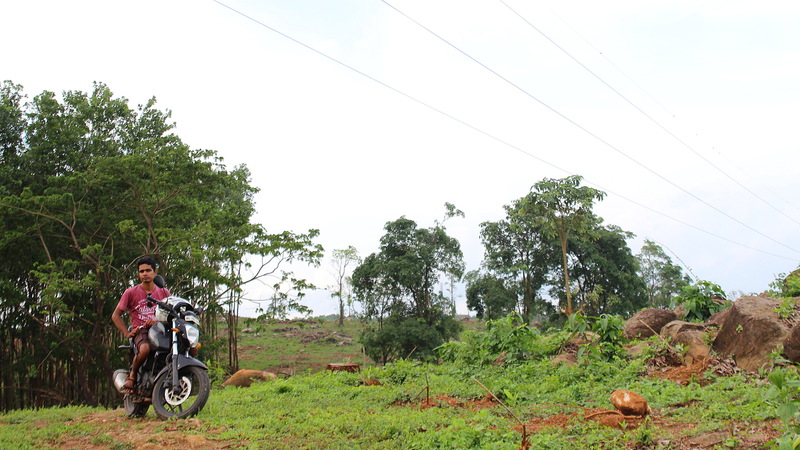 Every morning, he’d just say “let’s go”, I’d hop on the back of his motorcycle and we’d drive around the sights Kerala. 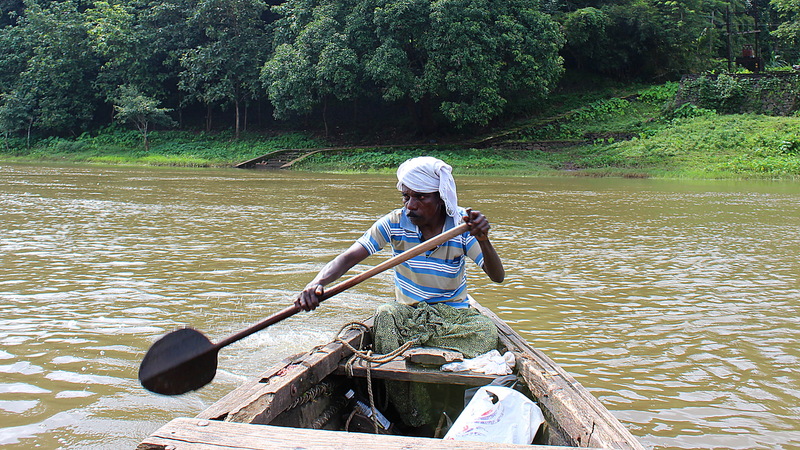 We saw waterfalls, elephants, fishermen at their work… all the stuff most tourist would see and then a bit more. Sometimes I’d tell Danial what I’d like to see (such as “I want to see pineapples grow!”) and then Danial, my personal driver and local expert, would take me there. The absolute highlight of the week was when Danial took me to his family’s organic farm. In a small area, his family was growing all kinds of fruits, plants and herbs. 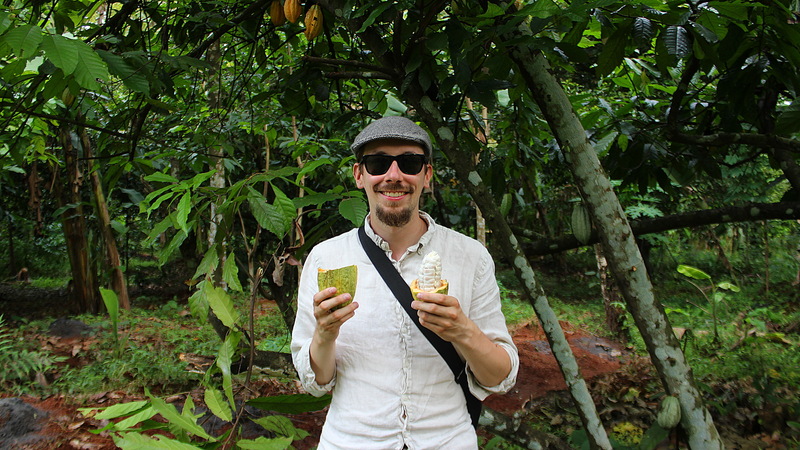 My first taste of fresh cacao fruit in Kerala, India. I am from Finland, where the possibilities of farming and gardening are much more limited. For me, the farm was just mindblowingly amazing! Danial would tell me about all the plants and pick up fruits and herbs for me to try as we walked around. It was just incredible how many different tastes you’d experience during a short walk. My favourites were probably fresh cinnamon leaves and pomelo, a giant citrus fruit. While I had been worried about monsoon season in Kerala, I got very lucky with my timing. During my stay with Danial, I never even saw the rain! While it was cloudy and wet at times, there were only two times when I almost witnessed the rain shower. The first time, it was early in the morning so I heard the water drop but then I just continued sleeping. I missed another short downpour later during a visit to a clothing and sports store in Kochi. 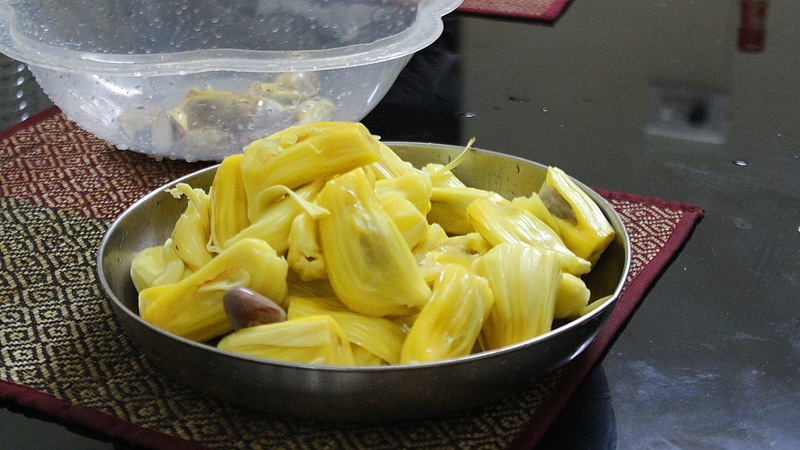 I had never heard of jackfruit before, and I just loved it! The fruit has a mild but still very sweet and juicy taste. Monsoon travel in Kerala. 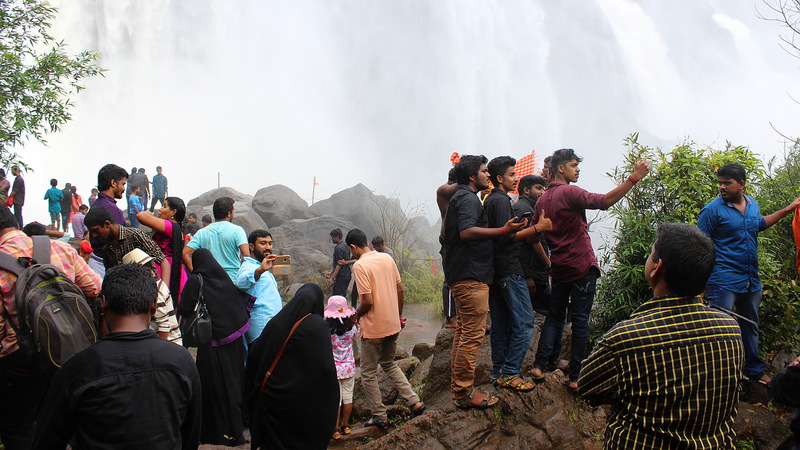 While plenty of tourists were visiting the attractions of Kerala, most of them were from India. All the states of India have their separate identities, and Kerala is no different. The state of the southwest is probably more relaxed and closer to nature than those up north. Kerala also has its own language, Malayalam, which is not even related to Hindi. The signs at the train stations and other public announcements where written in three languages, the third being English. I found it interesting that many locals who didn’t speak much English asked me if I spoke Hindi. When I told them I didn’t, some of them seemed to be genuinely surprised. 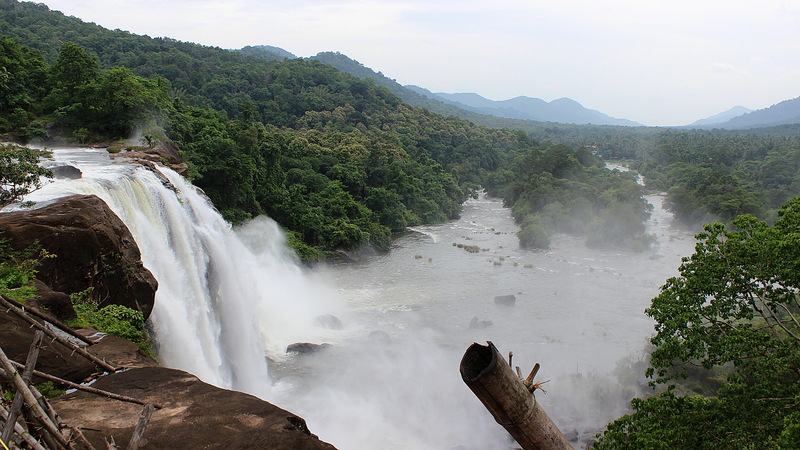 Below the Athirappilly Falls. Wet clothes guaranteed. Another local specialty that I noticed was that Christianity has many followers in Kerala. My village may have been exceptionally devoted and the father of my CouchSurfing host was an independent Evangelist, but it was still clear to me that the local Christianity was a bit different from the one I knew from back home. In Finland, three out of four residents are members of a church, but only a third of the population consider it likely that the miracles in the Bible have truly happened. Even those who are religious usually visit the church on special occasions and one’s faith is a quite private thing. Well, that’s not the situation in Kerala! No, this is a full-on version of Christianity where the daily miracles of God are as real as Adam and Eve, and believers show their faith in a very public way. For me, the funniest example of this was a tool shop in our village that the owner had named “Infant Jesus Hardware”. 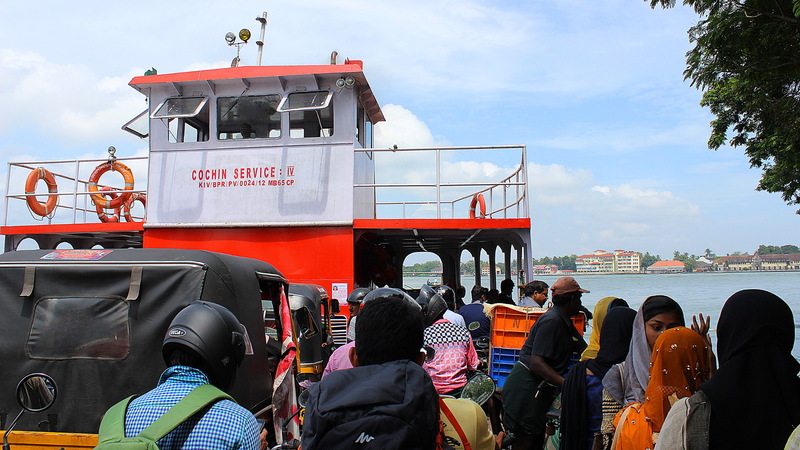 The ferry to Fort Kochi, the most touristy part of Kochi. 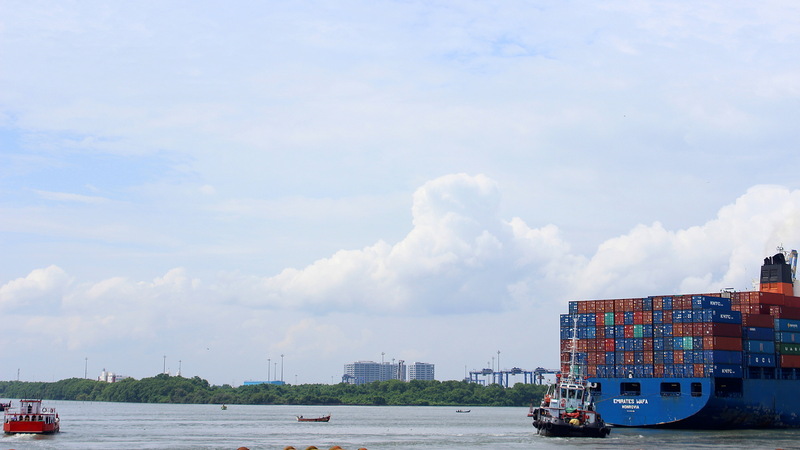 …the massive cargo ships and the noises of the city were never too far away. While Kerala is slowly getting more attention from international tourists, Western tourist is still a rare sight. This was especially true during the off-season monsoon travel in Kerala. During my whole week, I only saw about ten other Western tourists. 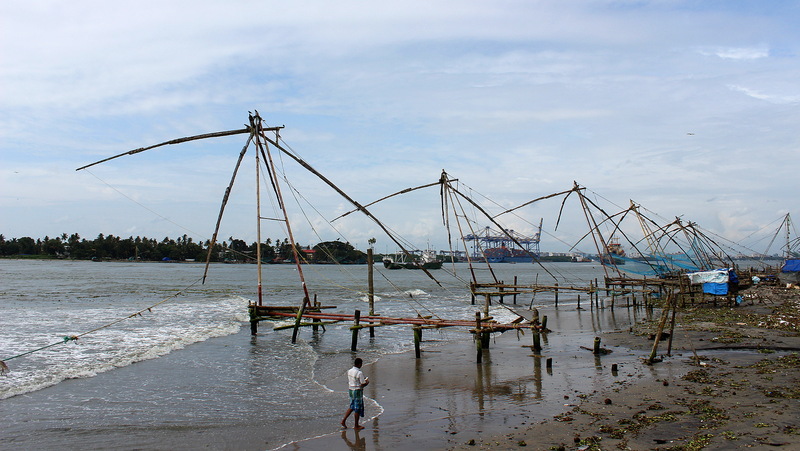 Most of them were in Fort Kochi, a touristy island in the city of Kochi where I stopped for just a few hours. Still, there were plenty of tourists traveling around, but most of them were from other parts of India. I mostly stayed in smaller towns where my pale skin became a tourist sight of its own. A lot of the locals would smile and wave at me or stop for a talk. The most extreme example of this was during one of my last days in Kerala, after I had left Danial’s place and moved to a northern town called Kannur. I went for a walk and stumbled into a school district – just as the school day was ending and all the children were filling up school buses. The greetings, questions and shy smiles just wouldn’t end. The first beach of my trip was in Kochi. After a cloudy morning, there was more than enough sunshine. While it was fun to see so much of India in such a short time, my magnificent time didn’t come without a price. I forgot my sunglasses home during my second full day when Danial and I visited the city of Kochi and spent a lot of time in heavy traffic. Having my eyes unprotected from the dust and pollution gave me an eye infection that took days to recover. That day was also one of the first days of my trip that I wore shorts for the whole time. The day turned also turned out to be surprisingly sunny for monsoon season in Kerala. The white and previously untanned skin of my right thigh burnt quite badly when it was exposed to direct sunlight during our motorcycle ride. While I had put some sunscreen on, I had forgotten to spread it on that area. On a positive note, it does look kind of funny when the only clearly burnt area of your skin is a 15-by-15 centimeter circle on the front of your leg! 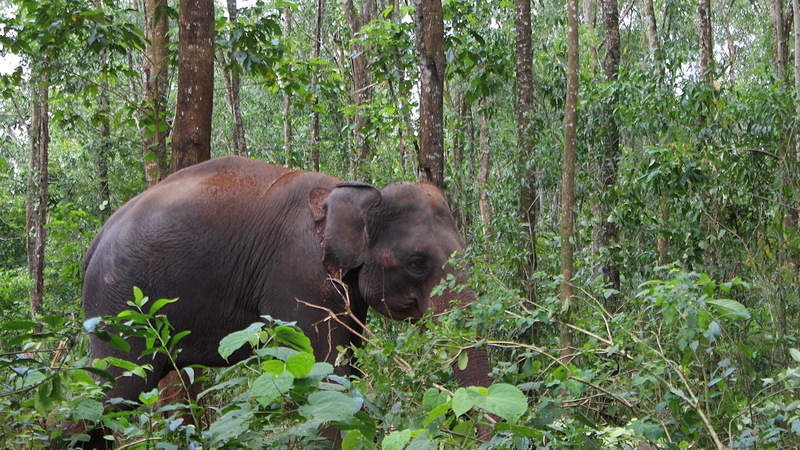 Taking a boat to a local elephant orphanage. At this point, my eye infection had a quite bad phase, my nose was running and I didn’t feel all too well, so I didn’t get too excited after finally seeing elephants. The eye infection became quite painful later. If I tried to focus my vision to different distances, the eye would instantly fill with tears. Even blinking my eyes would hurt. This was one of the very few times during my trip that I missed having more privacy. I didn’t want to (and didn’t) turn down the father of my host as he spoke to me in great lengths about the miracles of Jesus and the benefits of the Alkaline diet, but just looking at him hurt like hell. 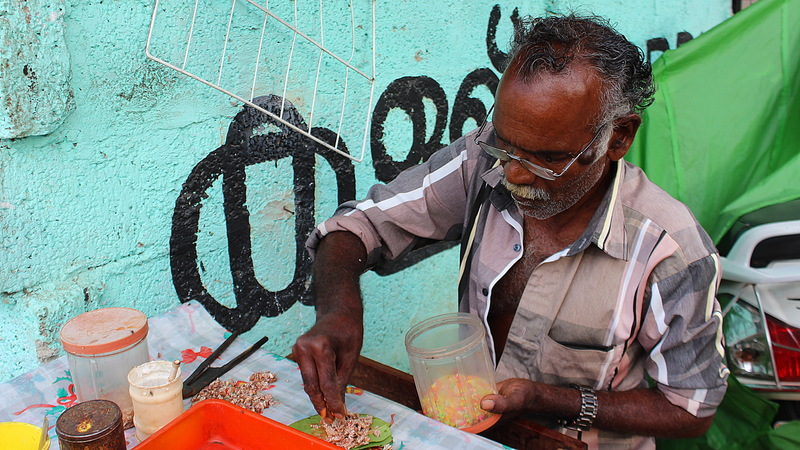 A local vendor making paan, a chewable tobacco roll with a wide variety of different ingredients. Yes, those are sprinkles he’s putting there. Neither didn’t it help that the local bugs were truly bugging me during my monsoon travel in Kerala. Irritating insect bites made sleeping more intermittent. I also learned to respect the navigation skills of the local ant the hard way, when I took a bite of a snack bar at night and left the opened package in my shoulder bag. In the morning, I found dozens of ants crawling in my my bag, with hundreds more forming a trail from the outside to their newfound nutrition source. 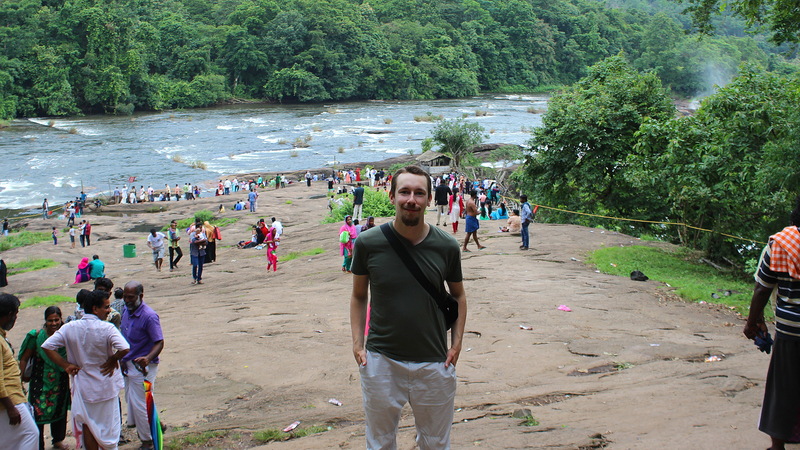 After my CouchSurfing stay was finished, I spent my last Kerala days in Kannur. 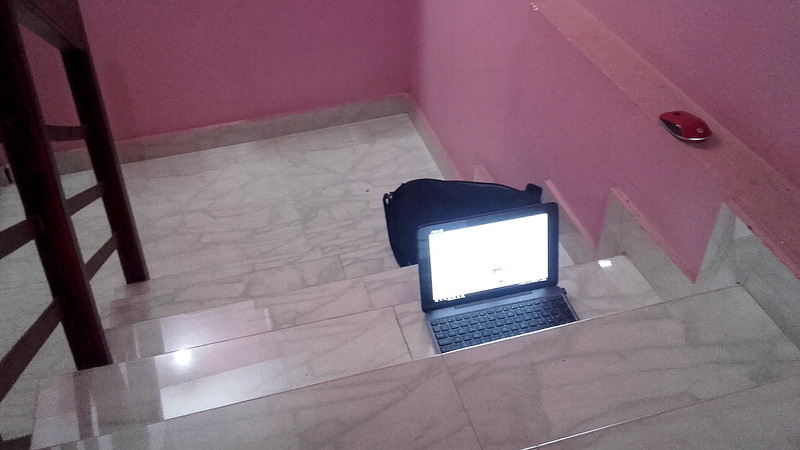 The WiFi of my one star hotel didn’t reach my room, so I set up a workspace in the stairway. When I left Kerala, I was a bit tired of all the fuzz I had been through. Eye drops and time had put an end to the pain in my right eye. Still, the eye couldn’t see clearly, only giving me a slightly blurry vision at best. And then, just as I was leaving Kerala, the raining began. However, all those issues would soon to be forgotten when I’d find my way to Gokarna. But I’ll tell more about that on the next blog post! interesting post, was in Kerala last week myself and I do recall seeing many a Church titled Infant Jesus Church. Interesting to hear that! 🙂 So, I wasn’t the only one who took notice to them. I hope you had a great stay in Kerala! Fabulous, the Ayurveda massages did me a world of Good. It is impossible to miss the Churches, they come up every 100 metres. I’ve never visited India during monsoon season but in Indian literature monsoon is well described. Indian seem to like monsoon, they find it romantic and beautiful. If you stop in Mumbai a must read book is Last Man in Tower by Aravind Adiga. The story takes place in modern day Mumbai during one monsoon season. P.S. What a pity you didn’t stop on beaches near Kannur. They are gorgeous! Many states in North East India and Goa too have Christianity as the major religion. And yes,almost everyone even in south can at least understand Hindi. Monsoon is my favorite season. I like to go to a good place in the monsoon season. Kerala is my favorite place for enjoying monsoon because Kerala is full of nature in monsoon season. Every side is greenery. 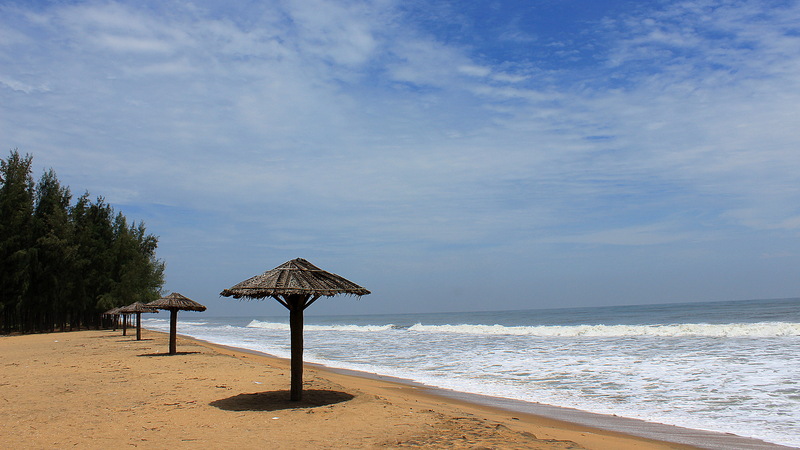 Thanks for the valuable information on Kerala travelling you share on this blog.